Go grab your crockpot and get ready to make this green split pea soup. We add carrots, onions, and celery (known as Mirepoix) as the base, along with some ham, garlic, and Better Than Bouillon ham-base stock. So Easy. This soup is scrump-de-ilicious! 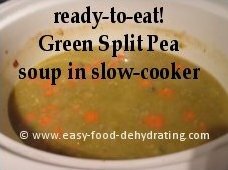 How to Make Delicious, Scrape-Your-Soup-Bowl-Clean, Green Split Pea Soup! 1. Use the freshly boiled water to re-hydrate the dehydrated items above. 2. 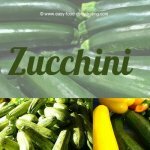 When they are sufficiently plump, put the veggies and their water in your slow cooker/crock-pot. 3. Add the ham stock and let it cool down a bit so you don't shock your crock(pot)! 4. Add the green split peas (check for stones, other foreign objects first!) Stir with wooden spoon. *IF you need to add salt, do so, BUT be careful NOT to over-salt as the bouillon has salt in it. 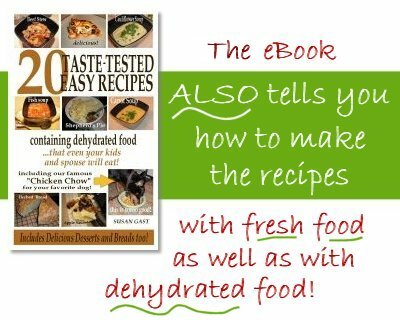 If you're interested in our dehydrated food recipes but you have the fresh food ingredients on hand, then please consider getting our eBook. In it, we show the recipes amounts not only in 'dehydrated' amounts, but in 'fresh-food' amounts too! We don't want anyone to miss out on these simple recipes that taste oh-so good! Click on the banner above for more info., thanks. The above images and/or links are Amazon ads, and as such, should you purchase an item by clicking on it, a cookie may be placed on your computer and Easy Food Dehydrating may receive a small commission from your purchase. Slow-Cooked Split Pea Soup — Perfection in a Bowl! Cook in the slow cooker/crock-pot on low heat all day — and you come home to the most delicious, smoooooth pea soup to be savored with a slice of bread'n'butter! 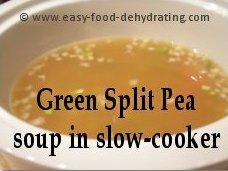 Don't forget you can use yellow split peas too — for a change — and this recipe lends itself to lentils just as easily, though I do have a lentil soup recipe for you to try. You can tell when this pea soup is fully cooked - there will be NO crunch to the peas, they'll just melt in your mouth. I love making this soup — it tastes so good — and it is very easy on the pocketbook. This will serve about 4 hungry people, or six if you're having a sandwich to go along with it. MUST DO: Get some of your fresh sliced bread, and treat yourself to some real butter. Spread generously — dip gently — chew slowly, and enjoy the taste! Any leftovers? It tends to thicken quite a bit overnight in the fridge, so add a little water to it if you wish to make it a little thinner.